Is Australia Falling Behind on Construction Productivity? Back in 1999, a glowing report from Deloitte found that Australia had a more productive construction sector than anywhere else in the world except for the United Kingdom thanks to a competitive environment, strong management skills, a robust subcontracting system and a sound knowledge and technology base. Fast forward to 2015 and doubts about our competitive edge are growing. Having grown at a good clip of almost 22 per cent in total over the 10 years to 2003/04, multi-factor productivity in the Australian construction sector grew by barely half that in 2013/14. Costs in some areas appear to be rising: website Gizmodo ranks the Royal Adelaide Hospital and the Gold Coast University Hospital respectively as the third and seventh most expensive construction projects in the world today. Internationally, as noted by the Productivity Commission in its report on infrastructure delivered last year, differing methodologies in terms of productivity measurement make direct comparisons of Australia’s productivity performance against international peers difficult, and any claims of Australia being falling well behind are difficult to substantiate with any certainty. 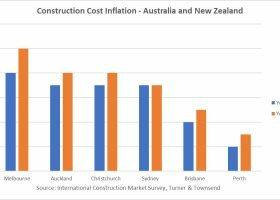 In its most recent comparison of international construction costs, Arcadis ranked Australia the sixth most expensive place to build out of 42 countries surveyed. Loosemore feels part of the problem may revolve around a sense of complacency brought about by our relatively strong economic performance over recent decades, which meant Australia has not had the same impetus for reform as many parts of Europe. “We haven’t suffered the recession which other countries have suffered, and although it’s been painful for them, that caused them to reflect and look at what they are doing,” Loosemore said. “The positive side of that is that they actually eliminated many of the inefficacies which built up within companies and economic systems. In terms of what’s going wrong, Loosemore says there are several factors. In contrast to places such as Singapore, the United Kingdom and several Scandinavian countries, Australia lacks strong leadership to drive change. A whittling down in informed buyer capability with buyers who understand that buying a building ‘is not like buying a Mars Bar’ and requires interaction with the industry is also a problem, he said. A politicised environment in which changing policies and project priorities makes it difficult for the sector to plan and be efficient exacerbates the problem. In contracting, meanwhile, a constant push to extract the lowest possible price point was restricting the ability for innovative approaches to design and construction, while a lack of recognition of the importance of good design was leading to projects being put out to tender with designs which were only partially complete and design consultants being given inadequate opportunity to prepare the best possible documentation. Within the sector itself, Loosemore says a fragmented approach could be much better integrated, adding that a number of project management graduates coming out of university do not have the supervisory skills needed to adequately supervise projects on site and need to be retrained. He feels construction firms themselves need to foster high performance workplaces with a vision of how to improve productivity and a communicative and collaborative environment in which those who contribute to positive are suitably rewarded. Doloi, meanwhile, talks of a top-down approach toward public sector buildings and infrastructure in which a lack of adequate community consultation had led to division and a lack of stakeholder support for some projects. Melbourne’s previously proposed East West Link project, which was canned following a change in government and persistent protests, was arguably a case in point. He also feels there is a disconnect between work being done in academia with regard to emerging new knowledge and evidence-based research through which scientific solutions can be delivered. An industry culture which is resistant to change does not help either, Doloi said. While both Loosemore and Doloi agree the current workplace relations climate is problematic and needs to be addressed and improved, both feel that excessive focus upon this area is detracting attention from other areas. Australia in the past has had an enviable reputation for construction efficiency. Whether or not we remain competitive going forward will depend on our ability to fundamentally rethink how we go about the entire construction process. You can navel gaze all you like the biggest impediment to the construction and mining industry is the union movement . As long as the tier one building companies kowtow to the union movement we will continue to be a regressive industry. The cost of industrial peace has made corruption endemic on both sides of the equation . It`s time to corporatise the union movement , clean out the union cronies in the FWA and restore the ABCC powers stripped by the ` unions `. Enterprise agreements "negotiated" under the façade of productivity , WHAT A JOKE. Loosemore's right – nearly a quarter of a century of consecutive growth has made us slothful and complacent. The cost of those hospitals in Adelaide and the Gold Coast are a ridiculous disgrace -they're not even leading cities within Australia.